The ATSA is a non-profit organisation founded in 1998 by Annie Roy and Pierre Allard. Their interdisciplinary interventions involve many artists and collectives and take many forms (installations, performances, theater, music, exhibitions). Nothing is a taboo for the duo, who irreverently tackles many social causes, ranging from climatic change to homelessness, sometimes leaving controversy in its wake. 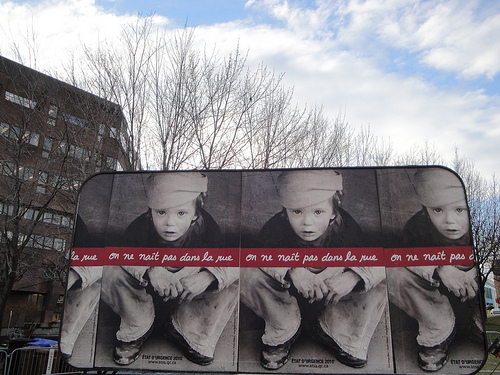 The « État d’Urgence » series (1998-2010), a refugee camp set up in downtown Montreal at the start of winter, undoubtedly remains ATSA’s most prominent intervention.